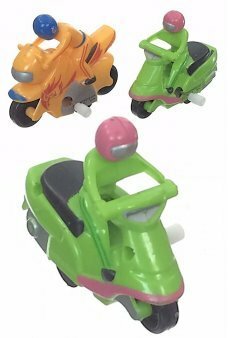 Find your favorite two wheeled vehicle among our classic tin toy Motorcycles and wind up Bicycles. 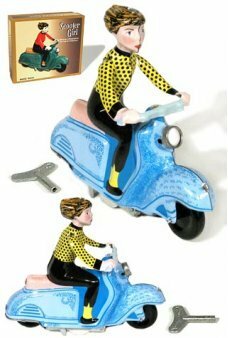 Every biker would love a Mini Motorcycle or Hog on his desk! 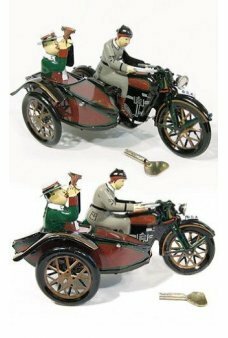 The Parade Motorcycle with side car features a horn blowing passenger on a handsome brown and green vehicle. 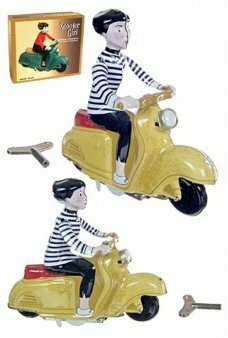 Wind-up his..
Our cutest tin toy features a Boy riding his bicycle while walking his dog. This adorable all-tin toy has a working chai.. 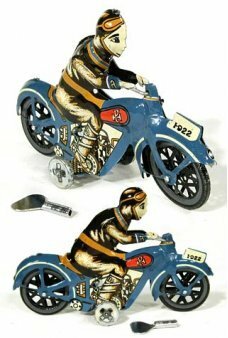 The blue bike is a reproduction of a 1900's european tin toy. 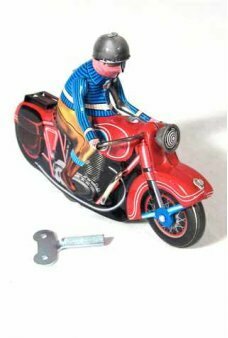 This all-tin toy has a working chain moves the bike. 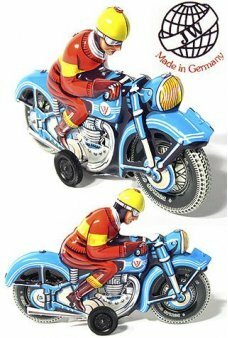 The m..
Our genuine German motorcyclist needs a push of his blue friction vehicle and away he goes. 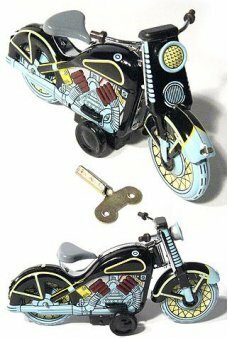 Made by tin toy craftman, Jo..
We imagine our proper lady hires the motorbike taxi for a ride around Tokyo on a cold evening. Wind up the Old Fashioned..
Ciao! Our cute Scooter Girl loves to ride her nice yellow motorbike. This modern woman wears a black and white striped b..
Our racer leans up and down as he drives his Winner Motorcycle. 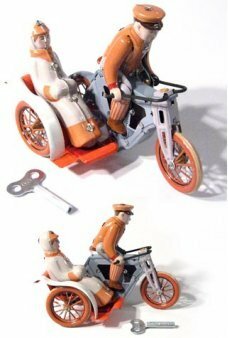 Our large classic tin motorcycle features a friction eng..
Our postman rides an early motorized bicycle. He wears a blue 1920's mail uniform on his red motorbike. His legs are joi.. The Saturn Motorcycle with side car is a maroon verison of the Saturn Motorbike with a red sidecar. Wind-up his all-tin .. This motorcyclist goes in a circle and sometimes falls down. He then automatically stands up his bike! The wind-up key o.. The Red Motorcycle is our biggest tin motorbike! 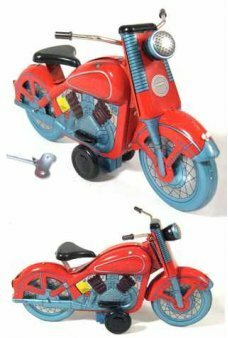 The all-tin bike has a red body with brown, yellow, blue and silver det.. The Saturn Motorcycle reminds us of retro bikes and fashions of a by gone era. Wind-up his green and red all-tin bike a.. This Amazing Motorcycle rides in a big circle and then he radically spins out in a tight circle - as if he put his foot ..
Our Colorful Spin Out Motorcycle does an amazing trick - He rides in a big circle and then he radically spins out in a t..
Our 2 Colorful Spinning Motorcycles start to race and then randomly spin and run into a different direction You ge.. 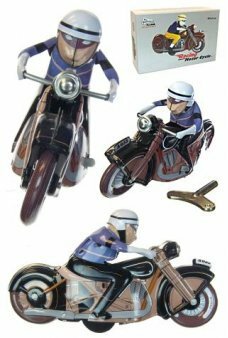 Whether you are a tin toy collector, motorcycle enthusiast, or just someone who appreciates a fun toy. You will love thi..
Vroom! 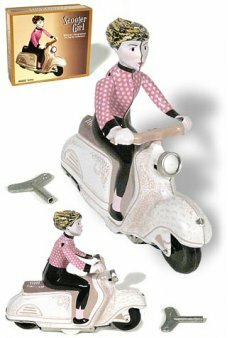 It’s the 1958 classic Duo-Glide Harley Motorcycle as a detailed all-tin wind-up toy. Wind-up the beautiful black ..
You can build our retro Chopper that really works! Friction action retro motorcycle creation. 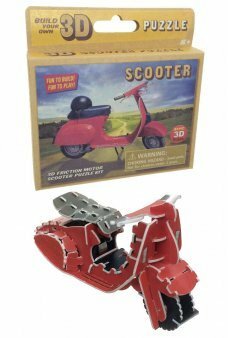 Our unique Chopper k..
You can build our red Scooter that really works! Wind up your retro motorbike creation and it rolls away. Our unique Sco.. 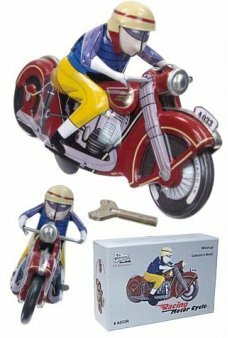 Hang this cute yellow and orange Motorcycle and Sidecar ornament on your tree. The all-tin Sport Motorcycle's 3 wheels m..
Drive across America from Chicago to LA. 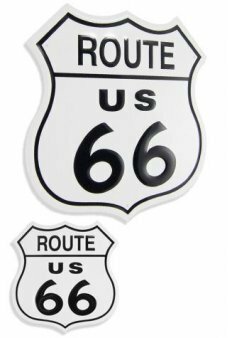 This attractive large metal road sign recalls the golden years of US Route 66. ..
Our motorcyclist leans forward as he drives his cycle with wild abandon! Wind up our handsome and primitive tin motorcyc..
Our cute Scooter Girl loves to ride her pretty blue motorbike. She proudly wears a yellow polka-dotted blouse and black ..
Our cute Scooter Girl loves to ride her nice green motorbike. This modern woman wears a orange blouse, black capri pants..
Our vintage Texaco Circle Sign features the classic logo with the Big Red Star. Texaco advertised as “The Star of the Am..
Our vintage Mobilgas Sign features the classic logo with the red flying horse, Pegasas. 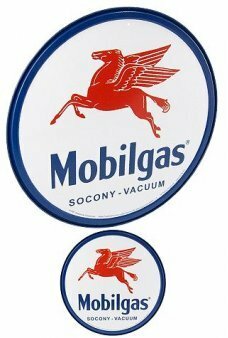 Mobil Gas began advertising with..
Vroom, Vroom! 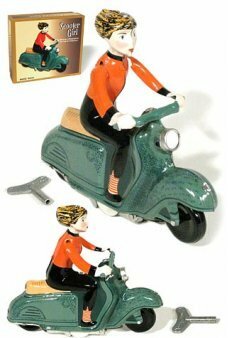 It’s the 1958 classic Duo-Glide Harley Motorcycle as a detailed tin toy. Wind up the handsome army green b..